This article provides steps for provisioning Azure-SSIS Integration Runtime (IR) in Azure Data Factory (ADF). 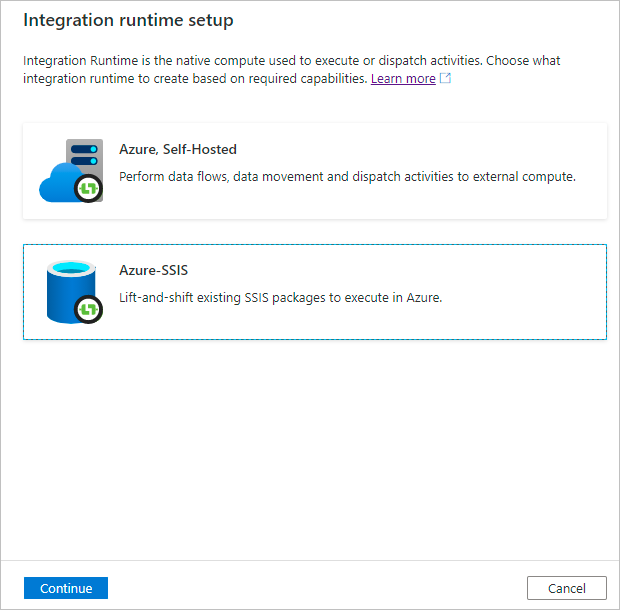 Then, you can use SQL Server Data Tools (SSDT) or SQL Server Management Studio (SSMS) to deploy and run SQL Server Integration Services (SSIS) packages on this integration runtime in Azure. Optionally use Azure SQL Database server with virtual network service endpoints/Managed Instance to host SSISDB. For guidance in choosing the type of database server to host SSISDB, see Compare Azure SQL Database single databases/elastic pools and Managed Instance. As a prerequisite, you need to join your Azure-SSIS IR to a virtual network and configure virtual network permissions/settings as necessary. See Join Azure-SSIS IR to a virtual network. Optionally use Azure Active Directory (AAD) authentication with the managed identity for your ADF to connect to the database server. As a prerequisite, you will need to add the managed identity for your ADF as a contained database user capable of creating SSISDB in your Azure SQL Database server/Managed Instance, see Enable AAD authentication for Azure-SSIS IR. When you create Azure-SSIS IR, ADF service connects to your Azure SQL Database server/Managed Instance to prepare SSISDB. It also configures permissions/settings for your virtual network, if specified, and joins your Azure-SSIS IR to the virtual network. When you provision Azure-SSIS IR, Azure Feature Pack for SSIS and Access Redistributable are also installed. These components provide connectivity to Excel/Access files and various Azure data sources, in addition to the data sources supported by built-in components. You can also install additional components. For more info, see Custom setup for the Azure-SSIS integration runtime. Azure subscription. If you do not already have a subscription, you can create a free trial account. Azure SQL Database server or Managed Instance. If you do not already have a database server, you can create one in Azure portal before you get started. This server will host SSISDB. We recommend that you create the database server in the same Azure region as your integration runtime. This configuration lets your integration runtime write execution logs to SSISDB without crossing Azure regions. Based on the selected database server, SSISDB can be created on your behalf as a single database, part of an elastic pool, or in your Managed Instance and accessible in public network or by joining a virtual network. For a list of supported pricing tiers for Azure SQL Database, see SQL Database resource limits. Make sure that your Azure SQL Database server/Managed Instance does not already have an SSISDB. The provisioning of Azure-SSIS IR does not support using an existing SSISDB. You are hosting SSISDB in Azure SQL Database server with virtual network service endpoints or in Managed Instance that is inside a virtual network. You want to connect to on-premises data stores from SSIS packages running on your Azure-SSIS IR. Azure PowerShell. Follow the instructions on How to install and configure Azure PowerShell, if you want to run a PowerShell script to provision Azure-SSIS IR. For a list of Azure regions, in which ADF and Azure-SSIS IR are currently available, see ADF + SSIS IR availability by region. Scheduling SQL Server Agent is not available. See Schedule a package execution in ADF pipeline. Managed Instance Agent is available. Authentication You can create SSISDB with a contained database user representing any AAD group with the managed identity of your ADF as a member in the db_owner role. See Enable Azure AD authentication to create SSISDB in Azure SQL Database server. You can create SSISDB with a contained database user representing the managed identity of your ADF. See Enable Azure AD authentication to create SSISDB in Azure SQL Database Managed Instance. Service tier When you create Azure-SSIS IR with your Azure SQL Database server, you can select the service tier for SSISDB. There are multiple service tiers. When you create Azure-SSIS IR with your Managed Instance, you cannot select the service tier for SSISDB. All databases in your Managed Instance share the same resource allocated to that instance. Virtual network Supports only Azure Resource Manager virtual networks for your Azure-SSIS IR to join if you use Azure SQL Database server with virtual network service endpoints or require access to on-premises data stores. Supports only Azure Resource Manager virtual networks for your Azure-SSIS IR to join. The virtual network is always required. If you join your Azure-SSIS IR to the same virtual network as your Managed Instance, make sure that your Azure-SSIS IR is in a different subnet than your Managed Instance. If you join your Azure-SSIS IR to a different virtual network than your Managed Instance, we recommend either a virtual network peering or virtual network to virtual network connection. 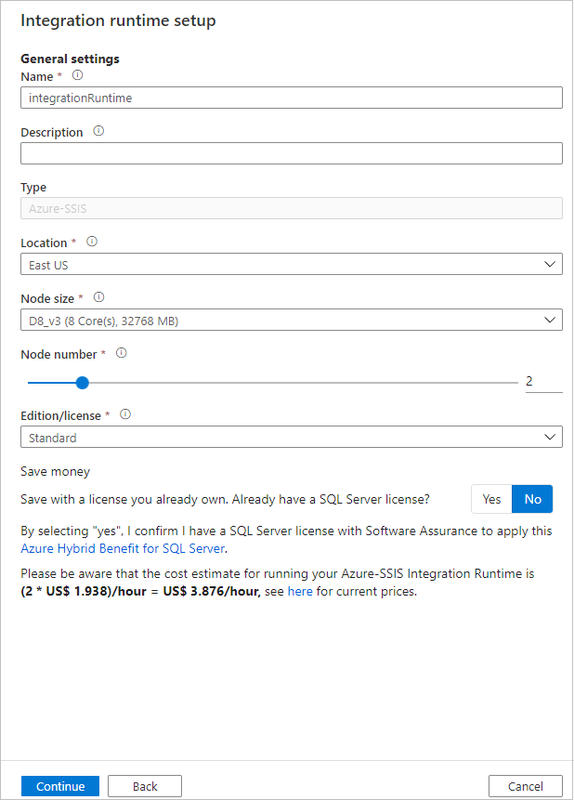 See Connect your application to Azure SQL Database Managed Instance. Distributed transactions Supported through Elastic Transactions. Microsoft Distributed Transaction Coordinator (MSDTC) transactions are not supported. If your SSIS packages use MSDTC to coordinate distributed transactions, consider migrating to Elastic Transactions for Azure SQL Database. For more info, see Distributed transactions across cloud databases. Not supported. In this section, you use Azure portal, specifically ADF User Interface (UI)/app, to create Azure-SSIS IR. Click New on the left menu, click Data + Analytics, and click Data Factory. 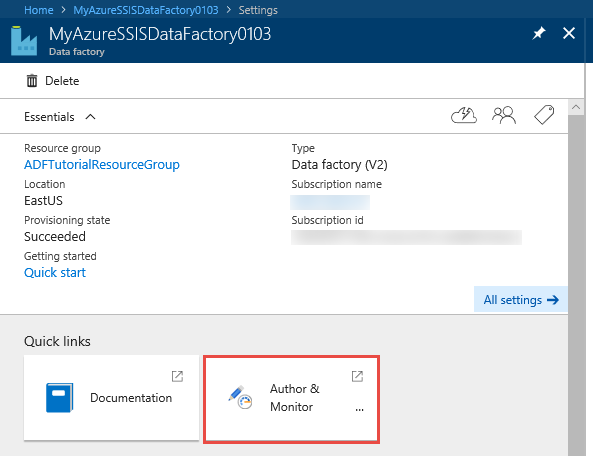 In the New data factory page, enter MyAzureSsisDataFactory for the name. The name of the Azure data factory must be globally unique. If you receive the following error, change the name of the data factory (for example, yournameMyAzureSsisDataFactory) and try creating again. See Data Factory - Naming Rules article for naming rules for Data Factory artifacts. 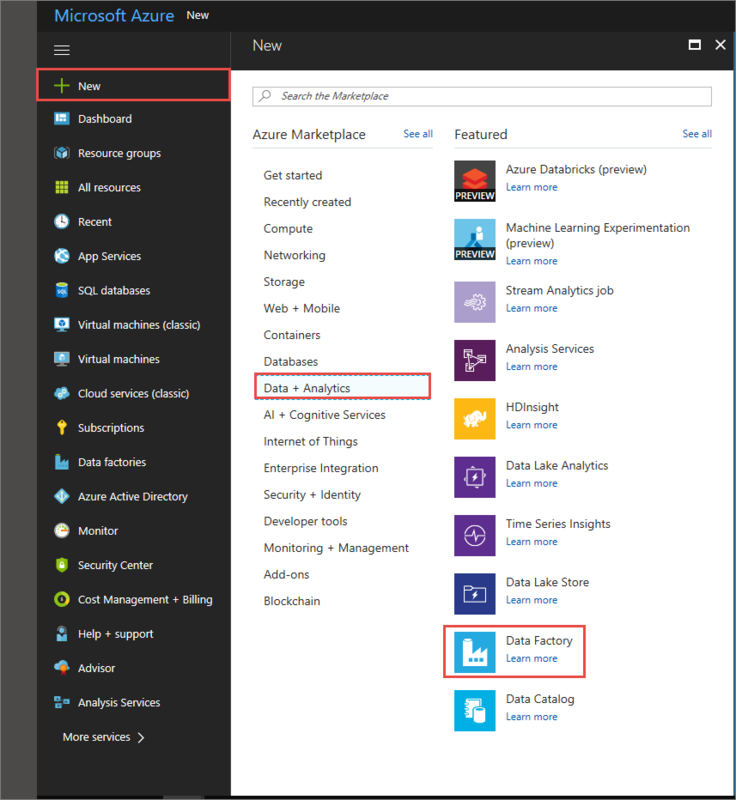 Select your Azure subscription in which you want to create the data factory. Select Use existing, and select an existing resource group from the drop-down list. Select V2 for the version. Select the location for the data factory. Only locations that are supported for creation of data factories are shown in the list. On the dashboard, you see the following tile with status: Deploying data factory. After the creation is complete, you see the Data Factory page as shown in the image. Click Author & Monitor to launch the Data Factory User Interface (UI) in a separate tab. In the get started page, click Configure SSIS Integration Runtime tile. a. For Name, enter the name of your integration runtime. b. For Description, enter the description of your integration runtime. c. For Location, select the location of your integration runtime. Only supported locations are displayed. We recommend that you select the same location of your database server to host SSISDB. d. For Node Size, select the size of node in your integration runtime cluster. Only supported node sizes are displayed. Select a large node size (scale up), if you want to run many compute/memory –intensive packages. e. For Node Number, select the number of nodes in your integration runtime cluster. Only supported node numbers are displayed. Select a large cluster with many nodes (scale out), if you want to run many packages in parallel. f. For Edition/License, select SQL Server edition/license for your integration runtime: Standard or Enterprise. Select Enterprise, if you want to use advanced/premium features on your integration runtime. g. For Save Money, select Azure Hybrid Benefit (AHB) option for your integration runtime: Yes or No. Select Yes, if you want to bring your own SQL Server license with Software Assurance to benefit from cost savings with hybrid use. a. For Subscription, select the Azure subscription that has your database server to host SSISDB. b. For Location, select the location of your database server to host SSISDB. We recommend that you select the same location of your integration runtime. c. For Catalog Database Server Endpoint, select the endpoint of your database server to host SSISDB. Based on the selected database server, SSISDB can be created on your behalf as a single database, part of an elastic pool, or in a Managed Instance and accessible in public network or by joining a virtual network. 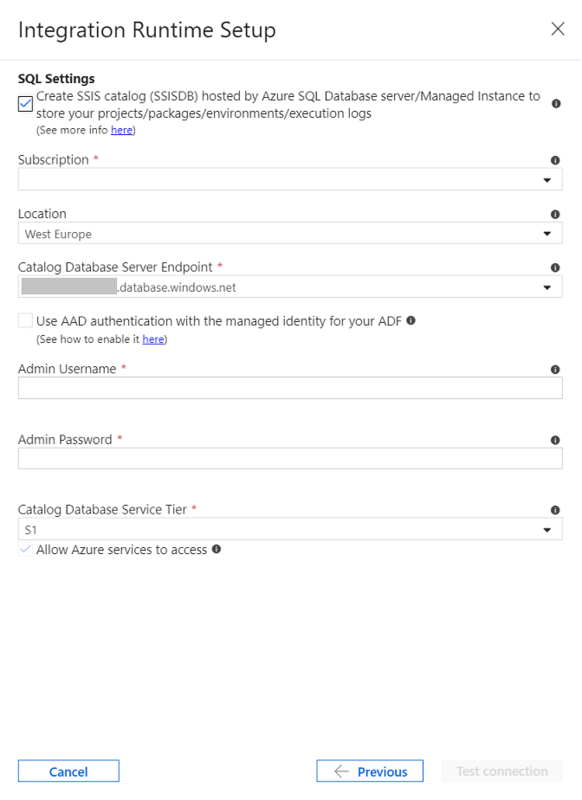 d. On Use AAD authentication... checkbox, select the authentication method for your database server to host SSISDB: SQL or Azure Active Directory (AAD) with the managed identity for your Azure Data Factory. If you check it, you need to add the managed identity for your ADF into an AAD group with access permissions to the database server, see Enable AAD authentication for Azure-SSIS IR. e. For Admin Username, enter SQL authentication username for your database server to host SSISDB. f. For Admin Password, enter SQL authentication password for your database server to host SSISDB. g. For Catalog Database Service Tier, select the service tier for your database server to host SSISDB: Basic/Standard/Premium tier or elastic pool name. h. Click Test Connection and if successful, click Next. a. For Maximum Parallel Executions Per Node, select the maximum number of packages to execute concurrently per node in your integration runtime cluster. Only supported package numbers are displayed. Select a low number, if you want to use more than one core to run a single large/heavy-weight package that is compute/memory -intensive. Select a high number, if you want to run one or more small/light-weight packages in a single core. b. For Custom Setup Container SAS URI, optionally enter Shared Access Signature (SAS) Uniform Resource Identifier (URI) of your Azure Storage Blob container where your setup script and its associated files are stored, see Custom setup for Azure-SSIS IR. a. For Subscription, select the Azure subscription that has your virtual network. b. For Location, the same location of your integration runtime is selected. c. For Type, select the type of your virtual network: Classic or Azure Resource Manager. We recommend that you select Azure Resource Manager virtual network, since Classic virtual network will be deprecated soon. d. For VNet Name, select the name of your virtual network. This virtual network should be the same virtual network used for Azure SQL Database with virtual network service endpoints/Managed Instance to host SSISDB and or the one connected to your on-premises network. e. For Subnet Name, select the name of subnet for your virtual network. This should be a different subnet than the one used for Managed Instance to host SSISDB. Click VNet Validation and if successful, click Finish to start the creation of your Azure-SSIS integration runtime. The Data Factory service connects to your Azure SQL Database to prepare the SSIS Catalog database (SSISDB). 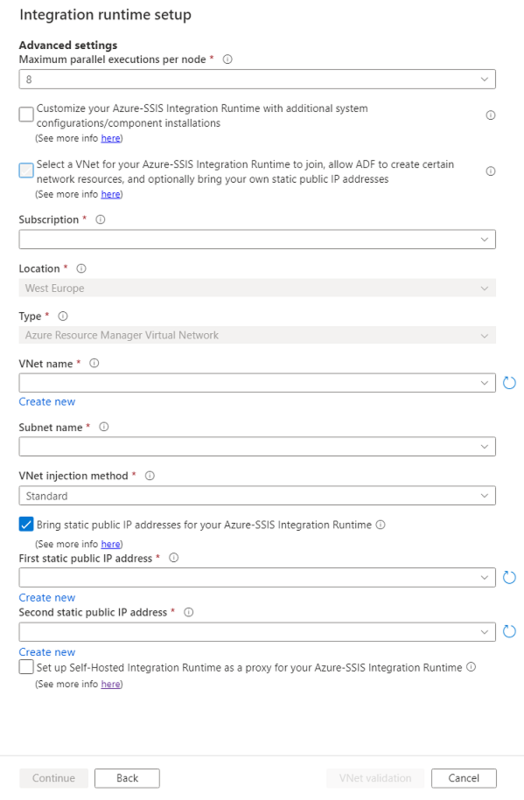 It also configures permissions and settings for your virtual network, if specified, and joins the new instance of Azure-SSIS integration runtime to the virtual network. In the Connections window, switch to Integration Runtimes if needed. Click Refresh to refresh the status. Use the links under Actions column to stop/start, edit, or delete the integration runtime. Use the last link to view JSON code for the integration runtime. The edit and delete buttons are enabled only when the IR is stopped. In the Azure Data Factory UI, switch to the Edit tab, click Connections, and then switch to Integration Runtimes tab to view existing integration runtimes in your data factory. Click New to create a new Azure-SSIS IR. To create an Azure-SSIS integration runtime, click New as shown in the image. In the Integration Runtime Setup window, select Lift-and-shift existing SSIS packages to execute in Azure, and then click Next. 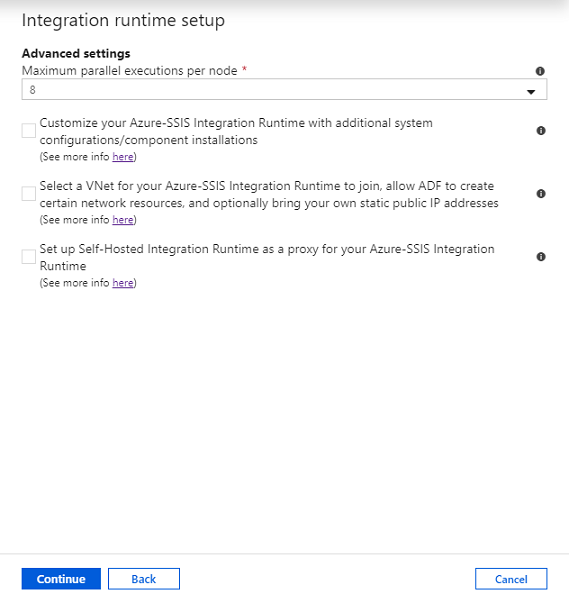 See the Provision an Azure SSIS integration runtime section for the remaining steps to set up an Azure-SSIS IR. In this section, you use the Azure PowerShell to create an Azure-SSIS IR. # If your input contains a PSH special character, e.g. 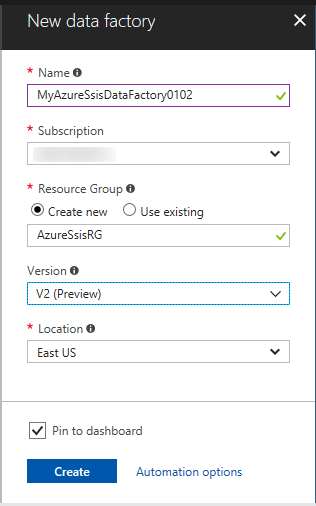 "$", precede it with the escape character "`" like "`$"
$SubscriptionName = "[your Azure subscription name]"
$ResourceGroupName = "[your Azure resource group name]"
$DataFactoryName = "[your data factory name]"
$AzureSSISName = "[specify a name for your Azure-SSIS IR]"
$AzureSSISDescription = "[specify a description for your Azure-SSIS IR]"
$SSISDBServerAdminUserName = "[your server admin username for SQL authentication or leave it empty for AAD authentication]"
$SSISDBServerAdminPassword = "[your server admin password for SQL authentication or leave it empty for AAD authentication]"
$SSISDBPricingTier = "[Basic|S0|S1|S2|S3|S4|S6|S7|S9|S12|P1|P2|P4|P6|P11|P15|…|ELASTIC_POOL(name = <elastic_pool_name>) for Azure SQL Database or leave it empty for Managed Instance]"
Add the following script to validate your Azure SQL Database server endpoint. Add the following script to automatically configure virtual network permissions/settings for your Azure-SSIS integration runtime to join. Create an Azure resource group using the New-AzResourceGroup command. A resource group is a logical container into which Azure resources are deployed and managed as a group. Run the following command to create a data factory. Run the following commands to create an Azure-SSIS integration runtime that runs SSIS packages in Azure. If you do not use Azure SQL Database with virtual network service endpoints/Managed Instance to host SSISDB nor require access to on-premises data, you can omit VNetId and Subnet parameters or pass empty values for them. Otherwise, you cannot omit them and must pass valid values from your virtual network configuration, see Join Azure-SSIS IR to a virtual network. If you use Managed Instance to host SSISDB, you can omit CatalogPricingTier parameter or pass an empty value for it. Otherwise, you cannot omit it and must pass a valid value from the list of supported pricing tiers for Azure SQL Database, see SQL Database resource limits. If you use Azure Active Directory (AAD) authentication with the managed identity for your Azure Data Factory to connect to the database server, you can omit CatalogAdminCredential parameter, but you must add the managed identity for your ADF into an AAD group with access permissions to the database server, see Enable AAD authentication for Azure-SSIS IR. Otherwise, you cannot omit it and must pass a valid object formed from your server admin username and password for SQL authentication. This command takes from 20 to 30 minutes to complete. Here is the full script that creates an Azure-SSIS integration runtime. Create a JSON file with the following Azure Resource Manager template. Replace values in the angled brackets (place holders) with your own values. "value": "<Azure SQL Database server admin password>"
To deploy the Azure Resource Manager template, run New-AzResourceGroupDeployment command as shown in the following example, where ADFTutorialResourceGroup is the name of your resource group and ADFTutorialARM.json is the file that contains JSON definition for your data factory and Azure-SSIS IR. This command creates your data factory and Azure-SSIS IR in it, but it does not start the IR. Now, use SQL Server Data Tools (SSDT) or SQL Server Management Studio (SSMS) to deploy your SSIS packages to Azure. Connect to your database server that hosts the SSIS catalog (SSISDB). The name of database server is in the format: <Azure SQL Database server name>.database.windows.net or <Managed Instance name.DNS prefix>.database.windows.net. See Deploy packages article for instructions. Azure-SSIS Integration Runtime. This article provides conceptual information about integration runtimes in general including the Azure-SSIS IR. Tutorial: deploy SSIS packages to Azure. This article provides step-by-step instructions to create an Azure-SSIS IR and uses an Azure SQL database to host the SSIS catalog. Monitor an Azure-SSIS IR. This article shows you how to retrieve information about an Azure-SSIS IR and descriptions of statuses in the returned information. Manage an Azure-SSIS IR. This article shows you how to stop, start, or remove an Azure-SSIS IR. It also shows you how to scale out your Azure-SSIS IR by adding more nodes to the IR. Join an Azure-SSIS IR to a virtual network. This article provides conceptual information about joining your Azure-SSIS IR to an Azure virtual network. It also provides steps to use Azure portal to configure virtual network so that Azure-SSIS IR can join the virtual network.